In today’s political climate, the terms "rural" and "Southern" tend to conjure up a specific image for many people — white, working class, and pro-Trump. This assumption has led many Trump opponents to reject policies aimed at aiding rural America. Consider the comments a recent Facing South report on the devastation Trump's budget would cause in rural communities drew from readers on Facebook. "Maybe if they suffer enough, they will vote the GOP out of office," wrote one reader. "They want sympathy. It is in the dictionary between s*** and syphilis," wrote another. A third said, "I no longer care what those people suffer." It's not just progressives (or Facing South readers) who are quick to dismiss the needs of small-town residents in the wake of last year's elections. In a 2016 column in the conservative National Review, Kevin D. Williamson wrote, "The truth about these dysfunctional, downscale communities is that they deserve to die." But this rejection of aid for rural, ex-manufacturing communities ignores two realities. First of all, most Trump voters were not members of the white working class. In reality, about 65 percent of white Trump voters had incomes of over $50,000 a year. Even among white voters without college degrees who voted for Trump, 60 percent were in the top half of the income distribution. Secondly, rural America — and particularly the rural South — is increasingly diverse. In fact, in 10 Southern states — Alabama, Arkansas, Florida, Georgia, Louisiana, Mississippi, North Carolina, South Carolina, Texas, and Virginia — racial and ethnic minorities make up over 20 percent of the entire rural population. 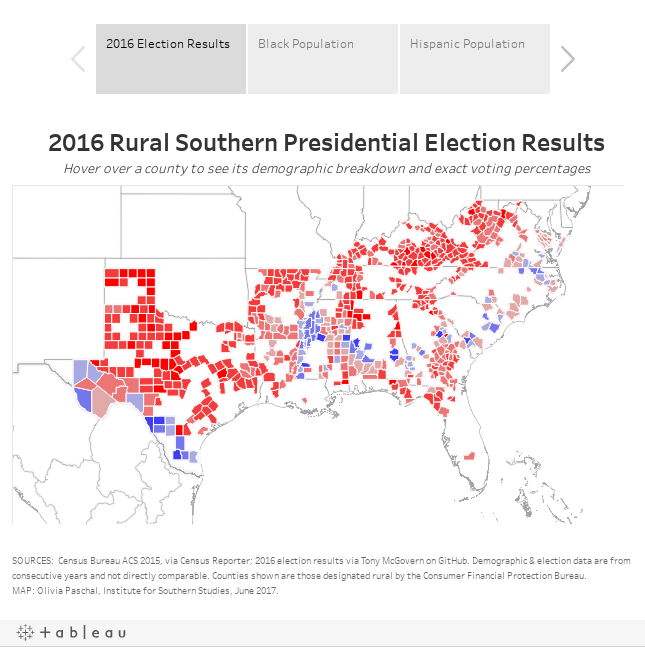 As the data visualization above shows, the rural South did not vote as a monolith in the 2016 election. In the Black Belt and across the Texas-Mexico border, many counties voted for Hillary Clinton, while counties in Appalachia, the Ozarks, and the Texas interior more typically voted for Trump. Yet if even a small portion of President Trump's proposed budget cuts are implemented, the rural counties that voted most decidedly against him will find themselves in the same boat as those that voted most decidedly for him. Fully 90 percent of America's entire rural Black population is concentrated in the South. The majority lives in the Black Belt, which stretches across Alabama and Mississippi into the Southeastern coastal plain and encompasses some of the poorest rural counties in the nation. Made up of communities where the legacies of slavery, sharecropping, and Jim Crow are still readily apparent, the Black Belt has stubbornly high mortality rates that are exacerbated by poverty, lack of mobility, and limited access to health care. Cuts to Medicaid, rural hospitals, and grants for state rural health care offices — all of which President Trump's budget proposed — would leave people in these communities without access to affordable health care. Nationwide, the fastest-growing rural minority are Hispanics — and this is no different in the South. In Texas, for example, Hispanics already make up 31 percent of the rural population. Increasingly, Hispanics are moving into rural areas, including in Appalachia and elsewhere in the rural South where population numbers are stagnating or declining, helping to slow population drain and revitalize small towns. But the high poverty rate of these communities often forces them into substandard housing. Most of the federal rural housing programs are threatened with the axe in Trump's budget proposal as well. The continuing influx of immigrants into many rural Southern communities will also increase demand on school systems that are already stretched to the breaking point. A recent USDA report concluded that regionally rural educational attainment is lowest in the South, particularly in counties in Appalachia, the Mississippi Delta, and along the Texas-Mexico border. Low education levels correlate with higher poverty rates — especially child poverty, the rate of which in the rural South excluding West Virginia is about 31 percent. Yet Trump's budget proposes deep cuts to public school programs. It also proposes completely eliminating funding for the Appalachian Regional Commission (ARC) and the Delta Regional Authority (DRA), federal agencies that play a crucial role in bringing economic development to impoverished regions. For example, the DRA has brought over $71 million in investments into Black Belt communities alone. The fact is, the rural South includes some of the country's most diverse and economically depressed communities. The refusal to recognize their needs because of the flawed narrative that their residents are to blame for President Trump's policies would only deepen the suffering of people already in a desperate situation and further victimize some of the most historically marginalized communities in America. Olivia is an undergraduate at Yale University majoring in history and political science and an intern with the Institute for Southern Studies/Facing South.